Affiliations: Center of Excellence for Aging and Brain Repair, Department of Neurosurgery and Brain Repair, Morsani College of Medicine, University of South Florida, Tampa, Florida. Abstract: The American Stroke Association reports 800,000 people suffer from a stroke every year, and it is the fifth most common cause of death in the United States. Currently, the therapeutic interventions are limited to tissue plasminogen activator or tPA, the only FDA-approved drug for ischemic stroke. Stroke inflammation extends beyond the brain, and may critically involve peripheral organs, such as the spleen. Accumulating evidence implicates the gut-brain axis in stroke pathology, suggesting that a healthy gut microbiome may play a crucial role in stroke recovery. 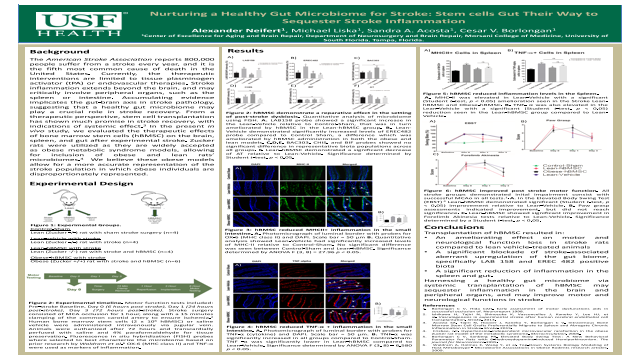 In the present in vivo study, we evaluated the therapeutic effects of bone marrow stem cells (hBMSC) on inflammation of the brain, spleen, and gut after experimental stroke. To mimic an unhealthy gut microbiome, the genetically obese Zucker rats, were subjected to stroke using the middle cerebral artery occlusion model, and three hours later transplanted intravenously with 2 x 106 hBMSCs or vehicle. Three days after transplantation, the brain, spleen, and gut were harvested for analysis of the inflammatory response and the gut microbiome. Harnessing a healthy gut microbiome via systemic transplantation of hBMSCs may sequester inflammation in the brain and peripheral organs, and may improve motor and neurological functions in stroke. Summary: The present study evaluates the therapeutic effect of bone marrow stem cells (hBMSC) on the gut-brain axis in stroke pathology, and their potential to ameliorate stroke-associated motor and neurological impairments, inflammation, and aberrant microbiome. 1. Borlongan C V, Hida CAH. Early assessment of motor dysfunctions aids in successful occlusion of. Neuroreport 1998. 2. Ishikawa H, Tajiri N, Shinozuka K, Vasconcellos J, Kaneko Y, Lee HJ, et al. Vasculogenesis in experimental stroke after human cerebral endothelial cell transplantation. Stroke. 2013. 3. Acosta SA, Tajiri N, Hoover J, Kaneko Y, Borlongan C V. Intravenous Bone Marrow Stem Cell Grafts Preferentially Migrate to Spleen and Abrogate Chronic Inflammation in Stroke. Stroke. 2015. 4. Frisbee, J.C. Hypertension-independent microvascular rarefaction in the obese Zucker rat model of the metabolic syndrome. Microcirculation. 2005. 5. Borlongan C V, Sanberg PR. Elevated Body Swing Test : A New Behavioral Parameter for Rats with 6-Hydroxydopamine-Induced Hemiparkinsonism. The journal for Neuroscience.1995.